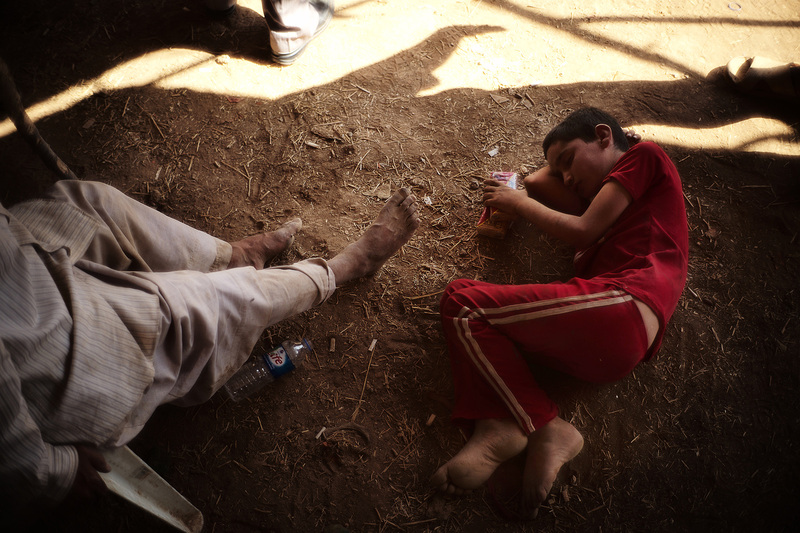 Above: After fleeing their homes in Sinjar, displaced Yazidi refugees wait for aid distributions at Bajid Kandal refugee camp in Dohuk province. 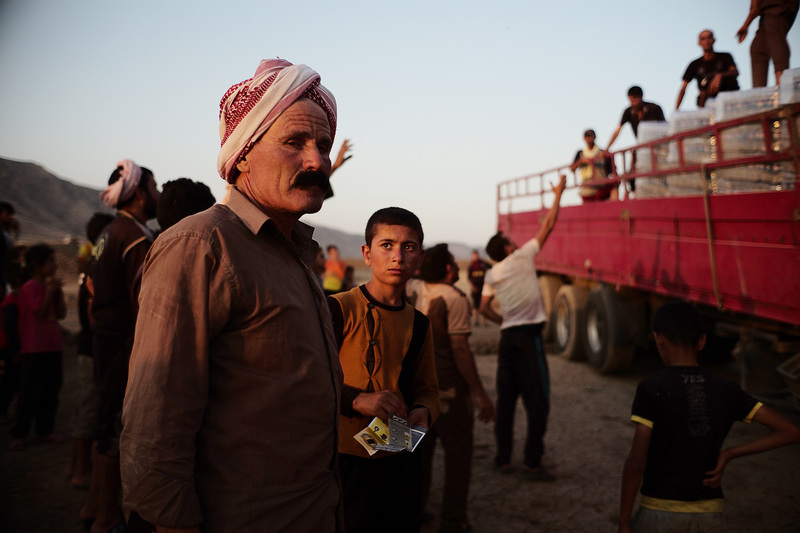 SINJAR, Iraq — Khodeda Abbas is one of the saved. His wife went into labor coming off the mountain and needed medical assistance right away. 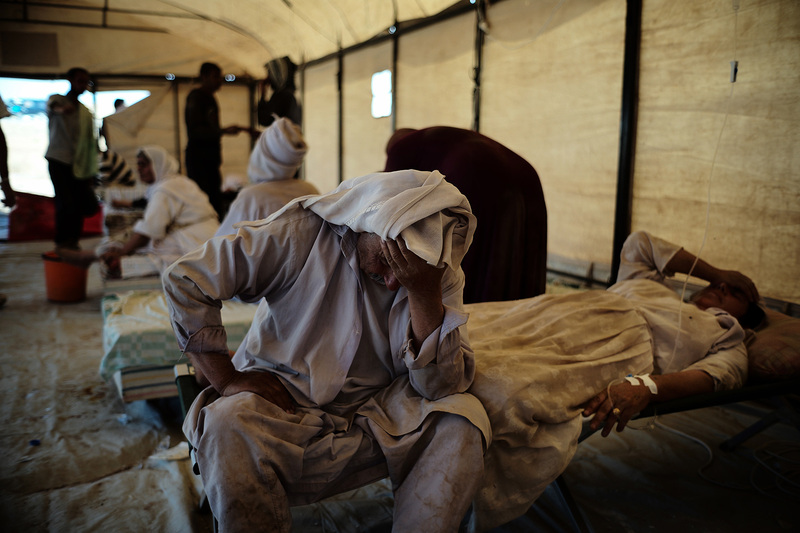 The couple had just arrived at a shabby medical tent 20 kilometers from Mount Sinjar, along with hundreds of other refugees rescued in tractors, buses and cattle trucks. 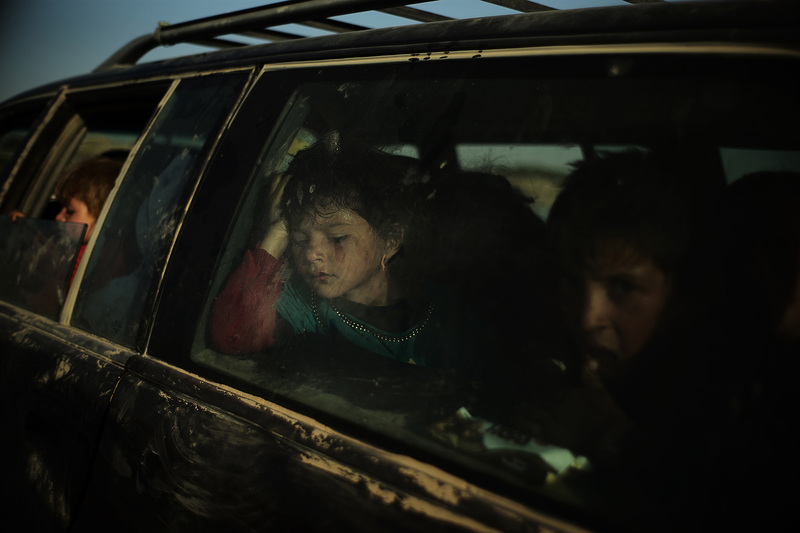 The drivers were all volunteers, men with enough gasoline and empathy to cross the desert and take exhausted strangers from Iraq into Syria over a border made only of dust. The tent had run out of medical supplies three days earlier. 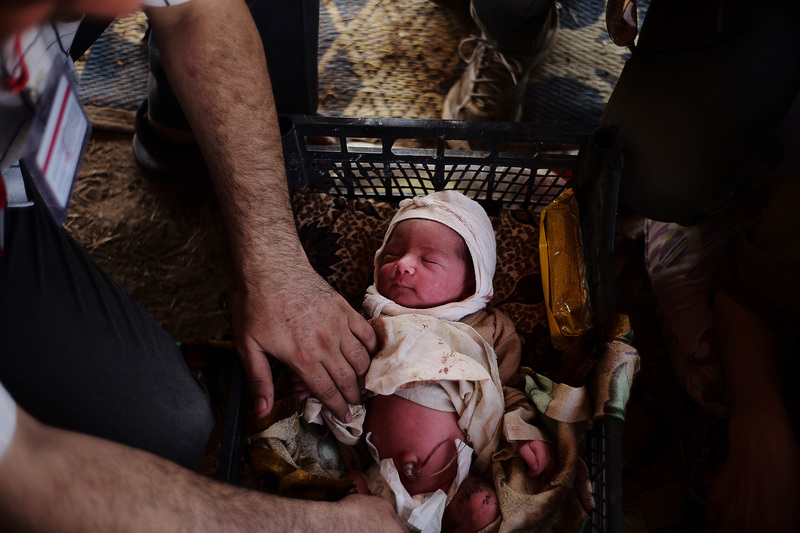 In recent weeks, IS forces have advanced deeper into Syria and overtaken cities in northern Iraq, killing, imprisoning and evicting those who don’t submit to their cause. 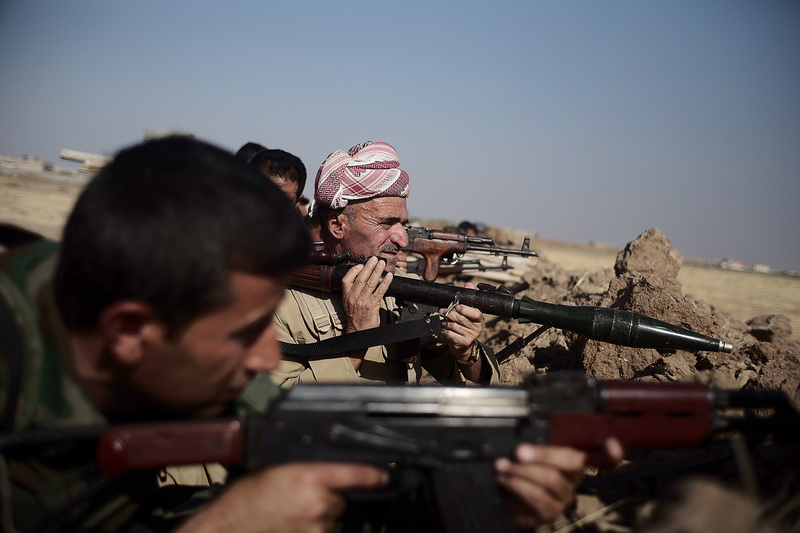 Kurdish forces in both countries have also been taking advantage of the current chaos to expand their territories. Here, the border between northwestern Iraq and northeastern Syria has effectively disappeared. Alliances are shifting and national identities are being discarded; many are turning to those they fear the least. That night in Siba Sheikh Khidr, Abbas said, he grabbed his Kalashnikov rifle and told his wife to get ready in case she had to leave without him. There were reasons to be fearful. Like most of his neighbors, Abbas is Yazidi. Followers of the ancient pre-Islamic religion, an estimated 700,000 globally, hold a special veneration for a fallen angel, Melek Taus, whose remorseful tears, they say, extinguished the fires of hell and brought the angel back to God. 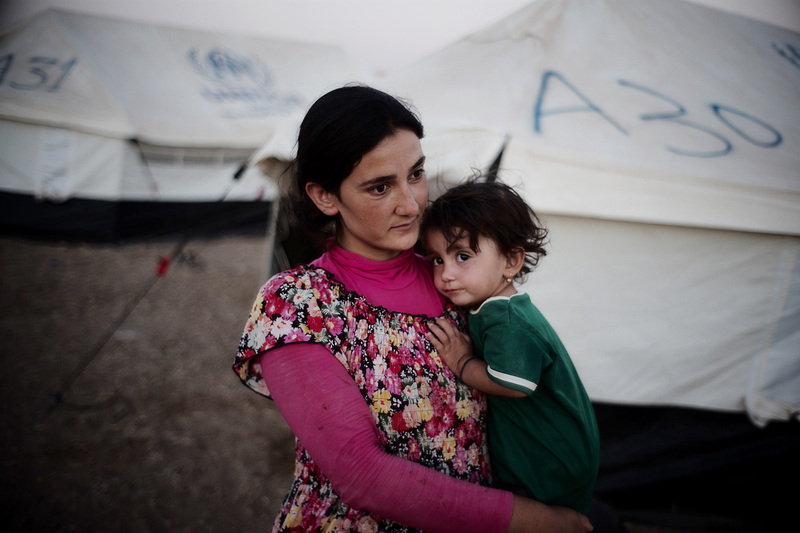 IS fighters and others call Melek Taus "Satan" and Yazidis “devil worshippers.” The Yazidis, like many minorities in the Middle East, have long lived near mountains, seeking safety in their remoteness. The cell-phone network was overloaded, so Abbas ran to his brother’s house and told him to gather as many men as he could. According to interviews with four survivors, perhaps 1,000 men — butchers, bakers, carpenters, young and old, most of them civilians — assembled near the military checkpoint in Siba Sheikh Khidr to form the only line of defense between IS and the city of Sinjar. Most of the Iraqi and peshmerga security forces that guarded the checkpoint in Siba Sheikh Khidr had fled, survivors said. The only ones who remained were Yazidi. 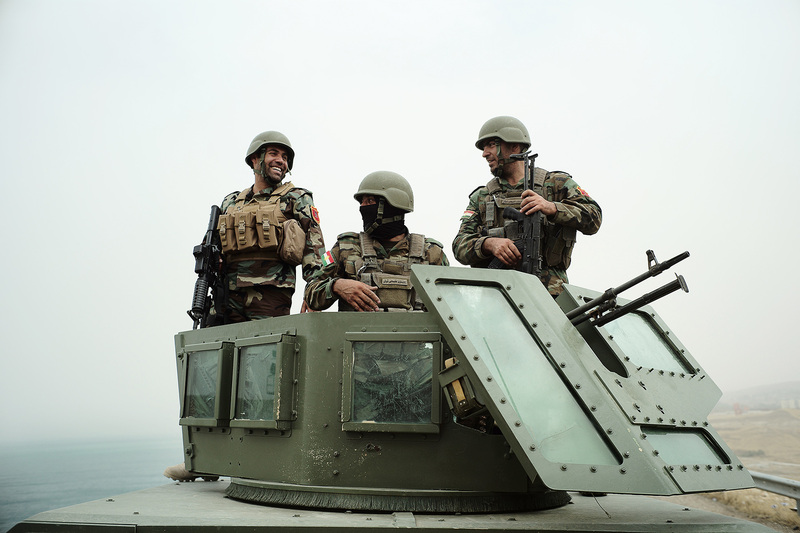 Abbas, a soldier in the Iraqi Army, and his brother, a member of the federal police, were among them. 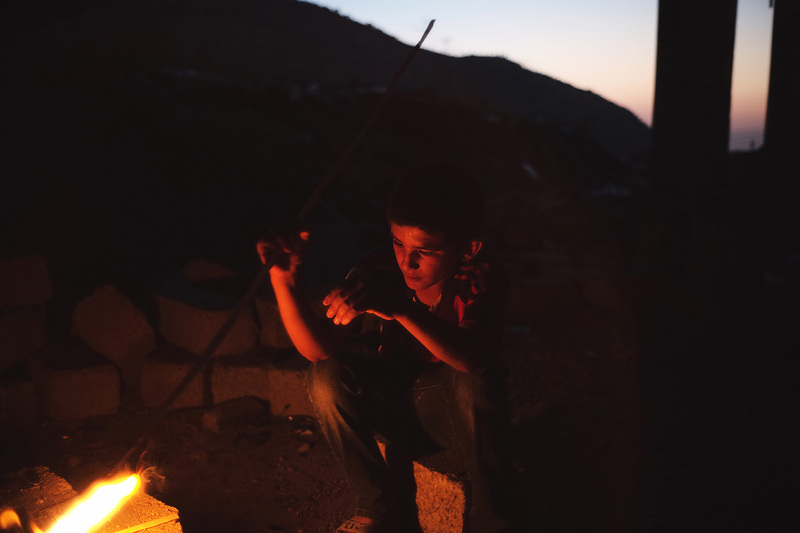 “We have to build a wall between Daash and Sinjar,” Abbas told his brother, the two of them filling empty rice sacks with stones, which they then used to barricade the road to town. Of all the bombings in Iraq this past decade, Siba Sheikh Khidr had seen the worst. In 2007, multiple suicide truck bombs killed more than 500 people there in what is considered to be the singe deadliest attack of the Iraq War. After the attack, the Iraqi government constructed a dirt berm perimeter to protect the town, making the only passage to the heartland of the Yazidis a single road. That night, Abbas and the others took positions on the berm around that road, waiting for the IS convoy to arrive. 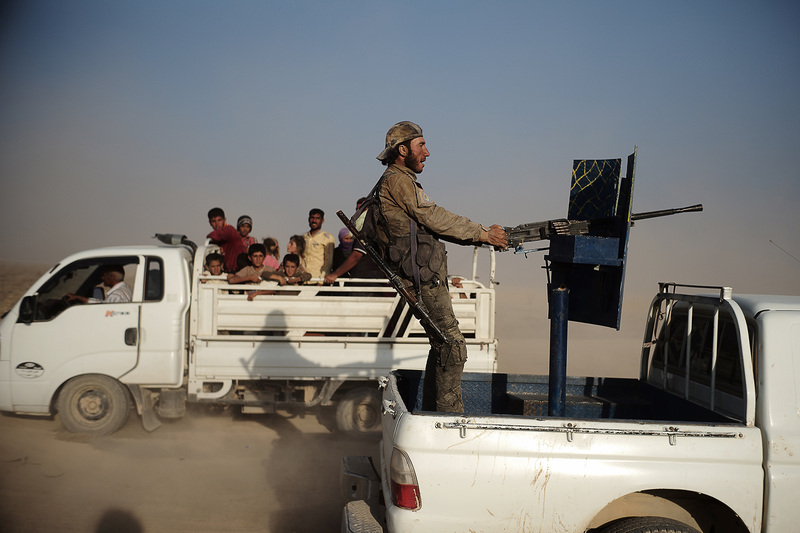 The IS fighters came in pickup trucks at first — more than 20, survivors said, each mounted with a Soviet-era machine gun known as the dushka. Like many Iraqi civilians, the people of Siba Sheikh Khidr kept Kalashnikovs in their homes for protection. That night, the villagers used them to fire on the incoming Daash convoy, forcing it off the road. 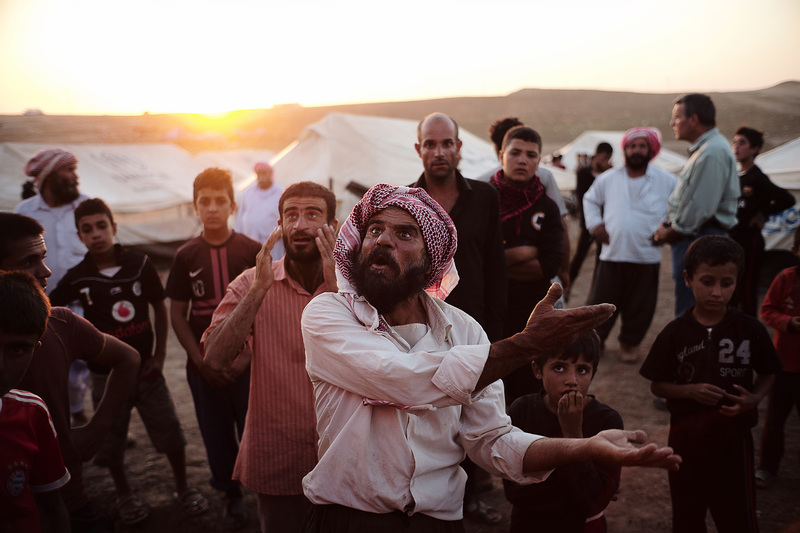 By 8 a.m., after five hours of fighting, the Battle of Sinjar was lost. 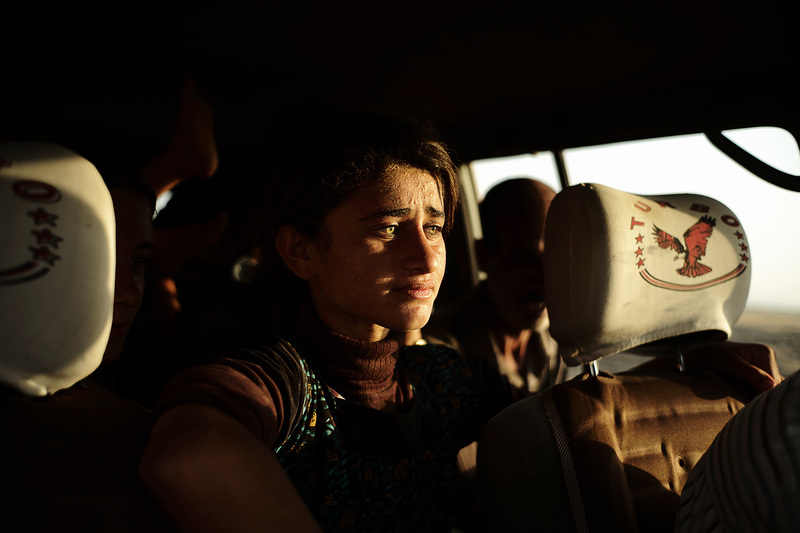 With no military assistance from Iraq’s central or Kurdish governments, the Yazidis had failed to hold the road and prevent Sinjar from falling to the Islamic State. They had, however, bought their brethren precious time to prepare an evacuation. As the Humvees drove past the barricades and on to Sinjar, Abbas said, survivors from the battle gathered their families and fled. 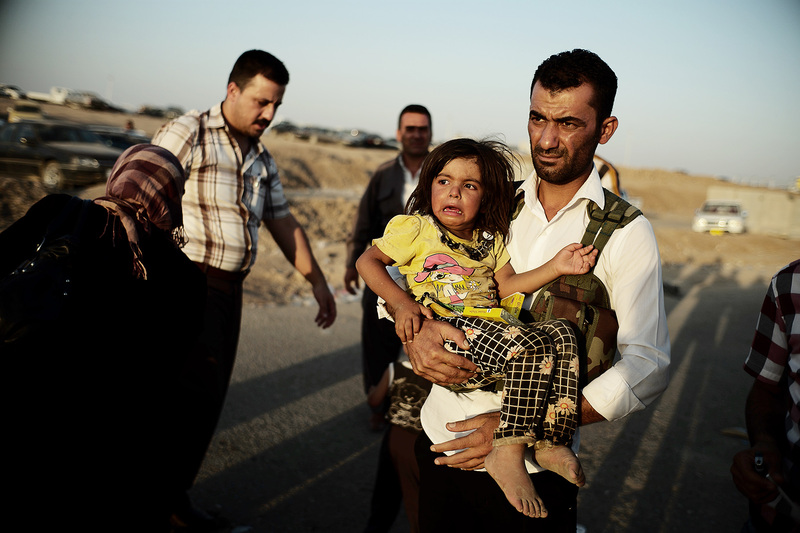 The only way out was up and over Mount Sinjar, a mountain range more than 60 miles long and almost 5,000 feet high. Tens of thousands of Yazidis would be stranded in there in the coming days, surrounded by IS fighters and facing death from malnutrition, dehydration and exposure. 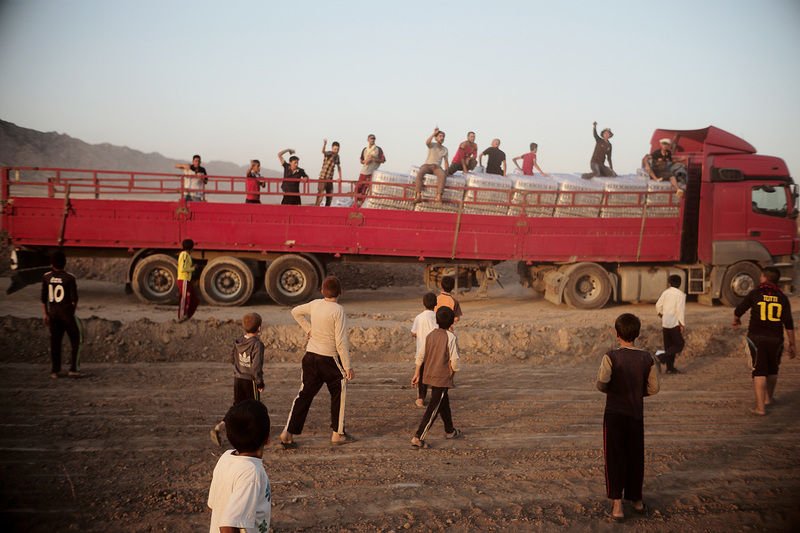 On Aug. 8, the United States launched airstrikes to repel IS forces and dropped pallets of food and water. But it was a group of Syrian Kurdish fighters known as the People’s Protection Units, or YPG, who fought through IS-controlled territory in Syria to establish a safe corridor to rescue many of the Yazidis from the mountain. The YPG fighters are the Syrian brand of the Kurdistan Worker’s Party, or PKK, which has been designated a terrorist group by the United States. 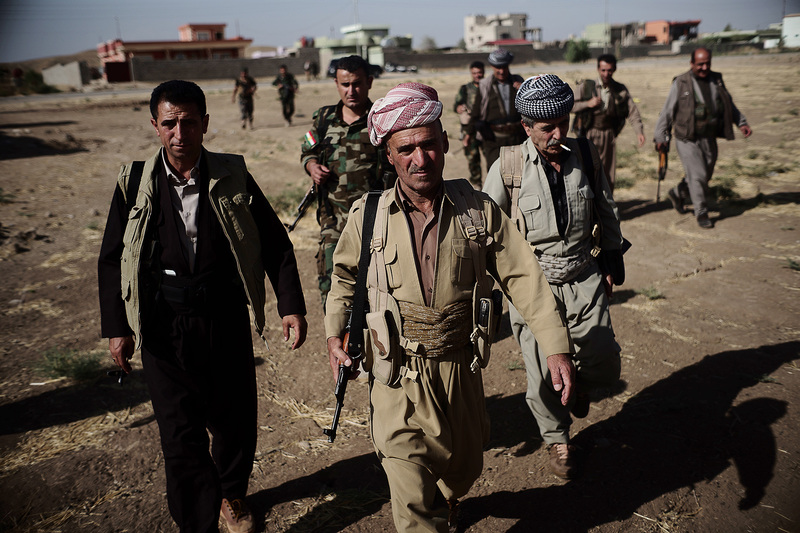 They are seeking to establish an independent Kurdish state in northeastern Syria. The civil war that has fractured since Syria since 2011 has provided the YPG an opportunity to dramatically expand its territory. 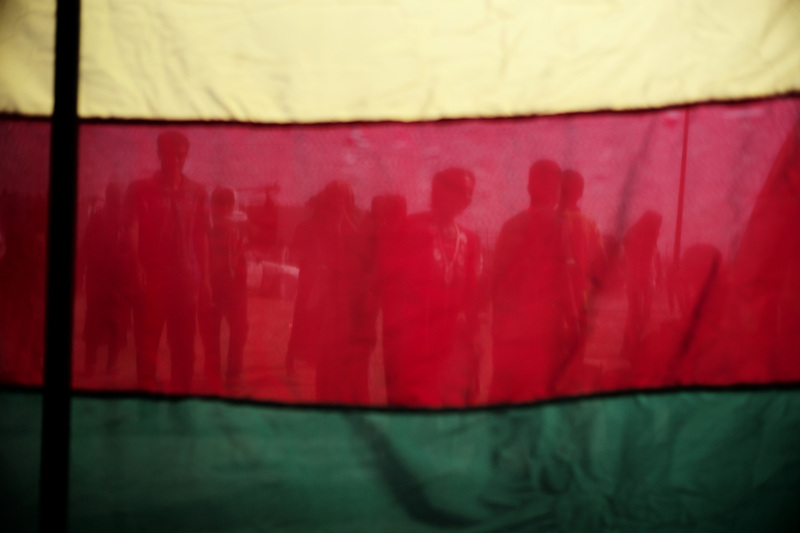 The only problem, however, has been that the borders of a new independent Syrian Kurdish “Rojava” — or “West” in Kurdish — are now being challenged by another opportunistic organization also trying to carve out a country from the wreckage of Syria’s civil war: IS. By August of last year, the YPG and IS were at war with one another. Abbas and other Yazidis who were assisted by the YPG are now shifting their allegiance to the group. Since coming off the mountain, hundreds of Yazidi have received training at YPG military training camps; some have already returned to Mount Sinjar to fight as new recruits for the YPG. “I belong to the YPG because they were the only ones who would protect us,” Abbas said. “From this moment, I am not Iraqi.” In the great plains and highlands of a part of the Middle East once known by the Arabic name Jazira, citizenship, for Abbas and many others, has become a choice forced upon them by armed groups attempting to carve out new ethno-national states. In Qamishli, a city in northeastern Syria, an armed man stopped our car. He was clean shaven and wearing the camouflaged uniform of the Syrian regime. “Don’t speak,” said Bahjat Muhammad, the driver, before rolling down the window. The city is home to the headquarters of the YPG, but also to the only checkpoints in the area still under the control of President Bashar al-Assad's Syria. At checkpoints across the Middle East, a password exists that can take one safely through to the other side. Said forcefully enough, it will confirm one’s identity better than any badge, stamp or signature on a piece of paper. In Baghdad, the password is “As’aib,” for Asaib Ahl al-Haq, a Shia death squad with total government impunity. In Lebanon’s Bekaa Valley, the word is “Hezbollah.” In Qamishli, that password is “guerrilla.” Translation: “I’m with the PKK. Get the f--- out of my way.” The men at the regime checkpoint stepped back, waving us through. “Allowing the regime to stay is useful,” said Ayman Mizowaya, an officer in the Asaish, the YPG’s intelligence agency, when explaining the contradictions of competing statehood in a city where a 15-foot statue of Hafez al-Assad, father of the current president and the Syrian leader for three decades, is watched over by the smiling faces of female fighters on YPG recruitment posters. On a recent visit to his office, he told me to listen. I didn’t hear anything. “Exactly,” he said. In Qamishli, “there is no bombing or shelling.” The regime’s presence is a symbol of tacit cooperation between the YPG and the Syrian regime. It helps maintain stability in Qamashli, deterring threats to the YPG and allowing both the regime and the Syrian Kurdish fighters to focus their military attention on other factions in Syria’s civil war, including IS. Although the YPG promises to bring a radically new kind of state to the Middle East, its offices looked just like those of any other regime in the region, down to the pink plastic flowers visitors stare at while awaiting the bureaucratic approvals that punctuate life across this region. As an employee of the Asaish since last year, Mizowaya is a supporter of the Kurdish struggle for independence. Yet he is an Assyrian Christian, not a Kurd. It’s a sentiment felt by members of most groups living across the Syrian-Iraqi borderlands with the important exception of one: Iraqi Sunni Muslim Arabs. 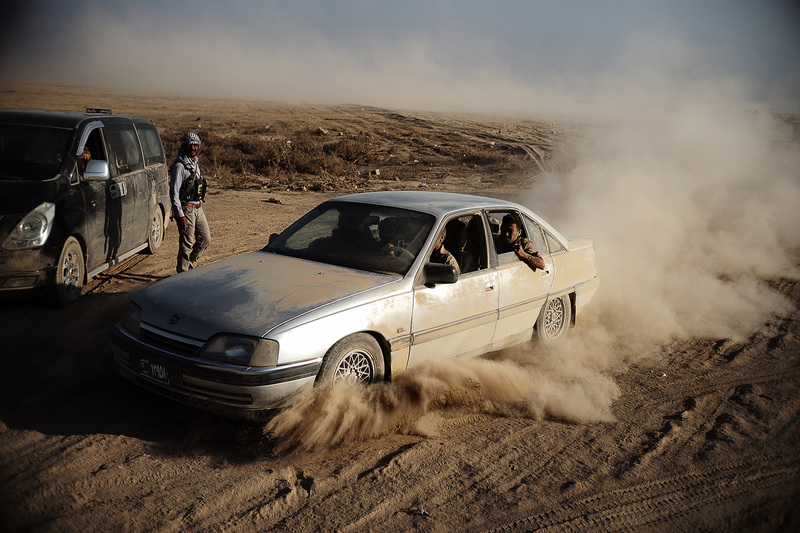 On Aug. 7, the day before the United States launched airstrikes to stop the advance of IS forces on the Iraqi Kurdish capital of Erbil, a white BMW drove toward the city from the Nineveh plains. The plains had just fallen to IS fighters, bringing the Sunni forces within 25 miles of the political and economic heart of Iraqi Kurdistan. 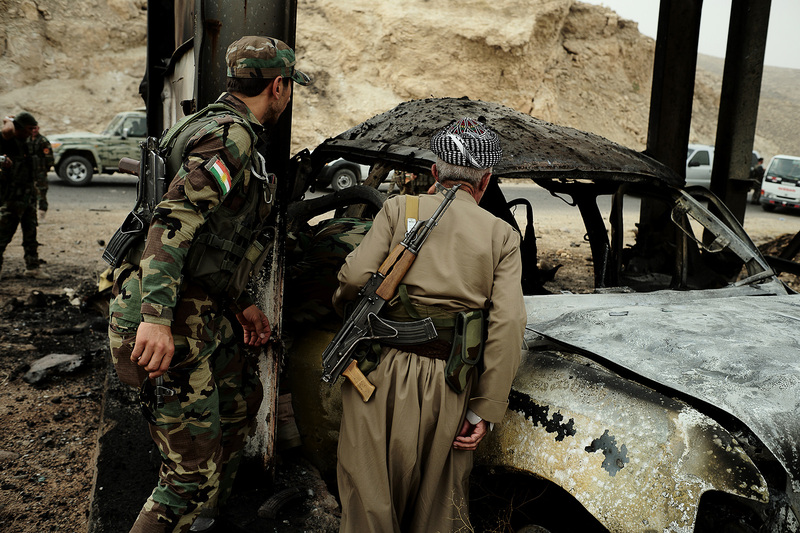 Like other vehicles fleeing IS forces, the car slowed to a stop at a checkpoint near hundreds of Kurdish peshmerga militiamen who were scrambling to set up a line of defense. 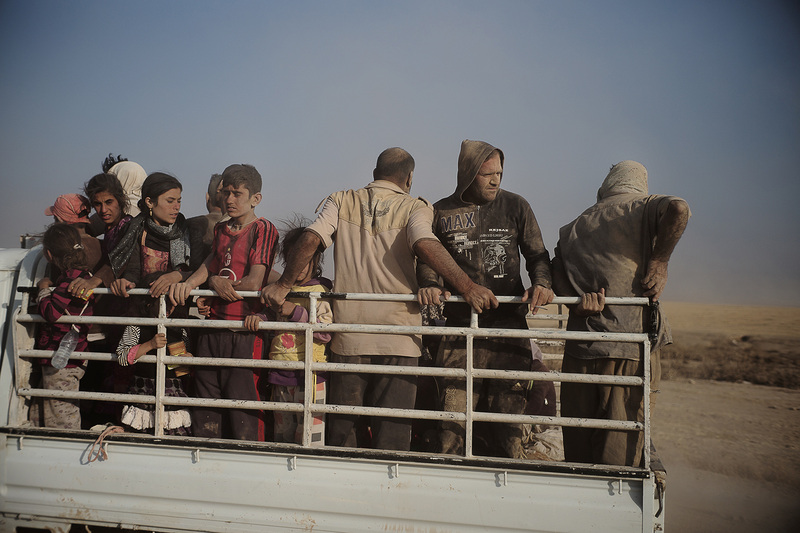 Religion is clearly stated on Iraqi identification cards and many of those fleeing the Nineveh plains were card-carrying Christians — but not all. Peshmerga at the checkpoint asked for IDs, often waving vehicles through in a matter of seconds. There was, however, some sort of problem with the BMW. 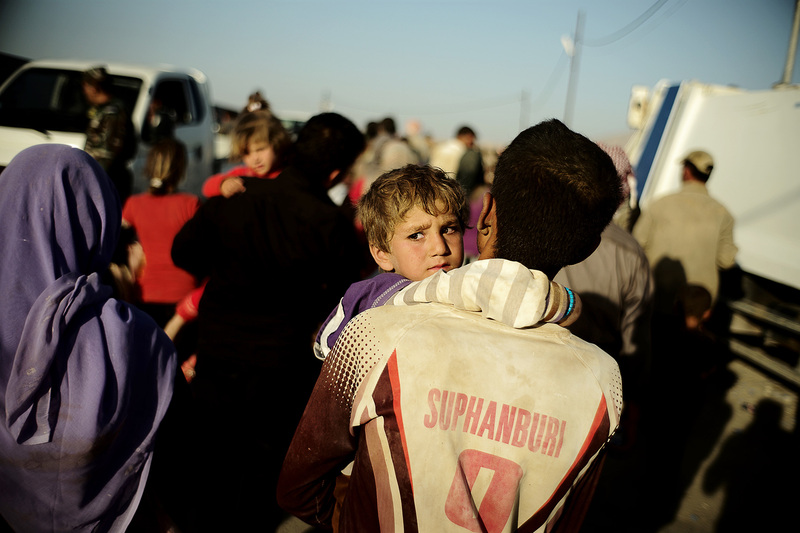 Before the Battle of Sinjar, IS had only managed to conquer parts of Iraq with a significant Sunni Arab population. 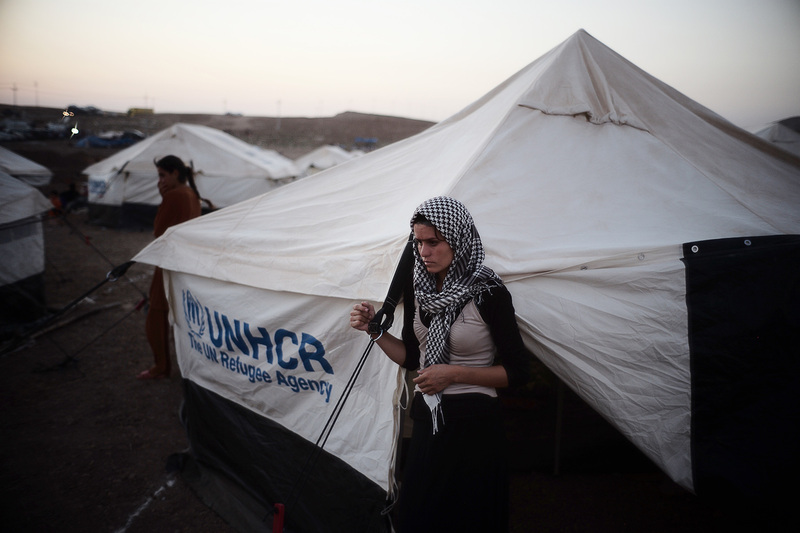 It had done so by capitalizing on the grievances of Iraq’s Sunnis. 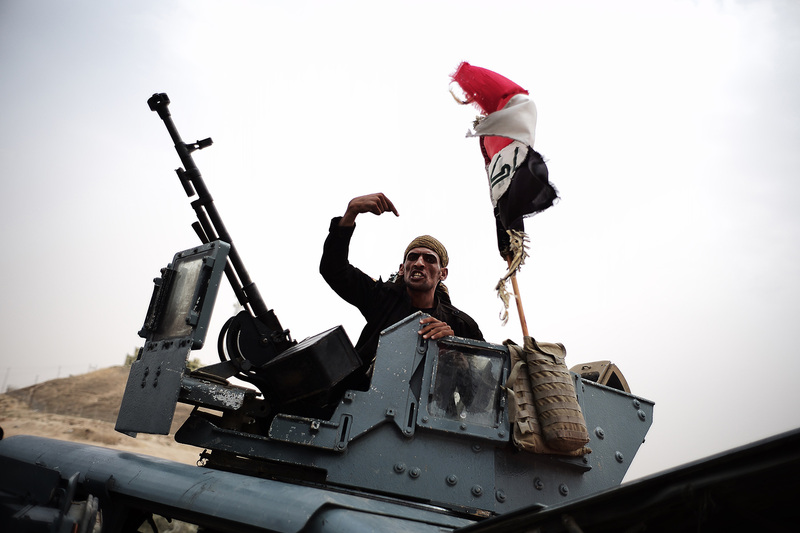 After the U.S. invasion of Iraq in 2003, Sunnis were sidelined and purged from positions of power by Nouri al-Maliki, Iraq’s Shia prime minister for eight years until he agreed to relinquish power this month. His government has also been accused of systematically targeting, imprisoning and torturing tens of thousands of Sunni men and women. Abu Hamoudi is among those Sunnis who’ve turned their support to IS. Of the five competing states now fighting to establish territory in northern Iraq and eastern Syria — two internationally recognized (Iraq and Syria), two Kurdish (YPG and Iraqi Kurdistan), and one Sunni (IS) — the latter is the most elusive. But reached by phone on a recent August day, Hamoudi, now the Islamic State’s emir in Mosul’s eastern Al Zahra quarter, started asking questions before I could ask my own. Hamoudi started to run through a long list of grievances against the media, the United States and Maliki. Like many local leaders in the IS ranks, Abu Hamoudi is a former prisoner. He said he was imprisoned and tortured under Maliki’s rule, targeted for being a former Baathist officer in Saddam Hussein’s army. There, in Mosul’s Badush prison, he said, a Shia prison guard called Jasim, nicknamed the monster, beat him regularly, eventually fracturing his spine. The product of a time that predates Al Qaeda and IS, Hamoudi did not speak the language of religious dogma. His words were more grounded in the language of Sunni supremacism. And they offered, with brutal simplicity, the Islamic State’s solution to a multiethnic Iraq: submit or be extinguished. © 2014 Al Jazeera America, LLC. All rights reserved.